What is a chicken and steak fajita? A fajita is a taco or flour tortilla topped with some kind of meat, vegetables and other sauces. Originally considered Tex-Mex cuisine or Mexican. What is Tex-Mex? Tex-Mex is a blend of Mexican and Southern American influences. Traditionally fajita recipes consist of flavored meats such as chicken, steak or shrimp with cooked vegetables and savory sauces. 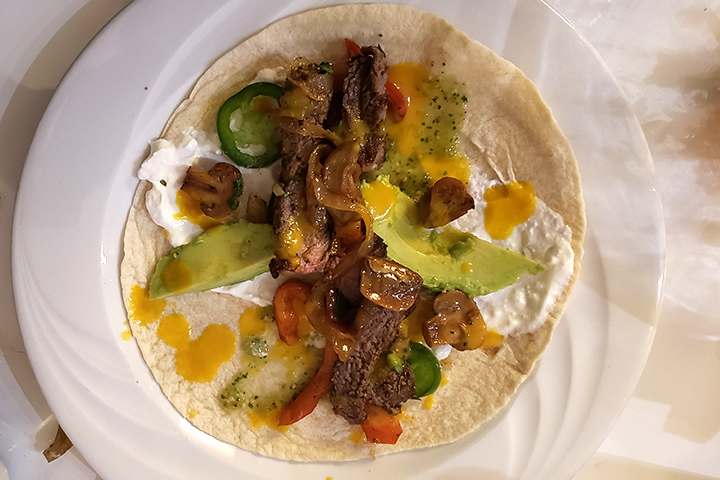 Today, I made a Mexican chicken and steak fajita with some of my own personal touches. Layers of flavor equals good cooking. Fajita recipes are the same thing. I don’t like cooking everything in the same pan for this as everything will taste the same. However a little more effort will be needed for this fajita recipe to taste amazing. For fajita vegetables I use peppers, onion and mushroom. 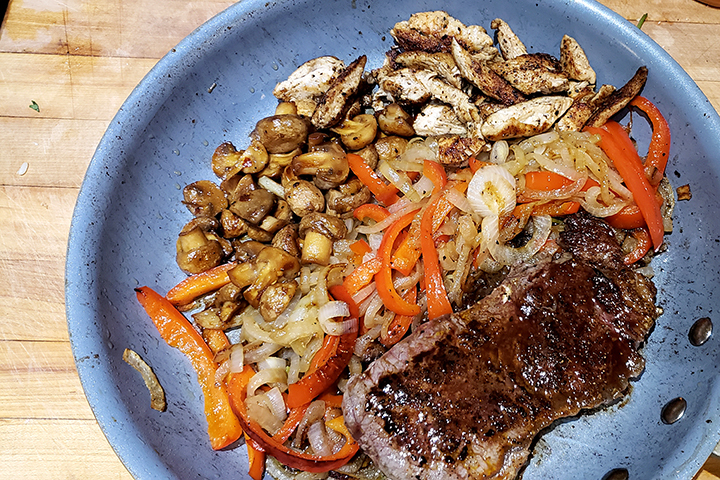 I like sauteing onions and pepper with some salt and pepper and the mushrooms I do with different flavors and separately. The recipe is above for the mushrooms. Steak was on sale so I added some steak. Same idea, salt and pepper, cook in a pan with some oil and butter. Fajitas are pretty basic, My Mexican chicken and steak fajitas are a little different. The key to an amazing tasting chicken or steak fajita is the sauces. A must have for fajitas is the tomatillo sauce, some kind of crema and an acidic hot sauce. This formula for great taste can be used for tacos as well. So obviously if you live in Mexico, use fresh tomatillo’s. If you live in Markham Ontario, use canned ones from your local grocery store. 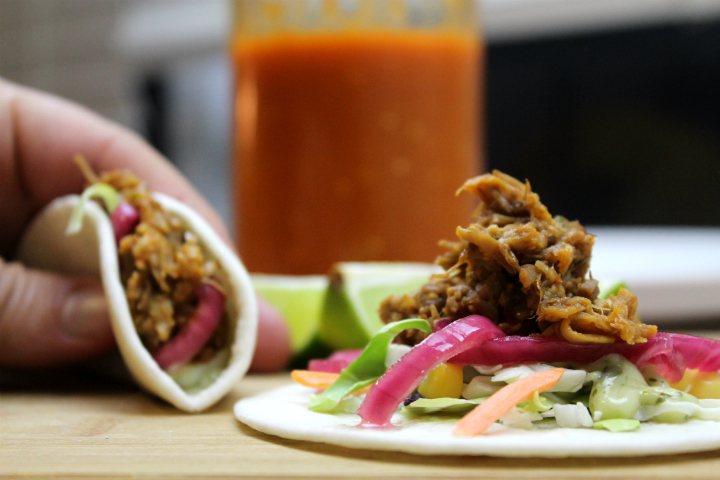 Canned is fine as long as you flavor with cilantro, jalapeno, lime juice and etc. Just puree it all together and voila! You have one layer of flavor. Next layer of flavor is some kind of crema which can be described as a cross between sour cream and French crème fraîche. In mexican cooking you can also flavor this with cilantro and lime or other mexican influences. 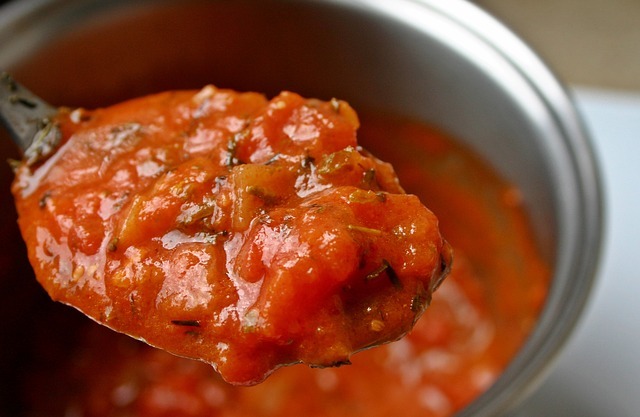 Puree all together and apply to your chicken and steak fajita. Make it look fancy by putting it in a squeeze bottle if you have and you can do a nice drizzle on top. Hot sauce is my final addition to this trio of sauces used to make amazing fajitas. Store bought is fine such as Tabasco or Franks hot sauce but something to consider is making your own hot sauce. My choice of peppers is the habanero or the scotch bonnet. Lovely fruitiness and lots of heat. Once you make your hot sauce out of these peppers, using a little will go a long way in fajitas or even taco’s. I usually include a recipe with my post, but due to the simplicity of this recipe I will elect to be lazy and not include one. Basically this is the recipe, season ingredients, prepare toppings you want on your fajita, cook vegetables, cook your fajita meat, assemble your chicken and steak fajita, enjoy! There might be some other steps in that process but you get the point.